If you appreciate my paintings, drawings, prints, and writings, please support my creations with a pledge of $1 or more. Your contribution will help assure that an independent, humanist, and challenging social realist art can survive in today's hyper-commercial art world. WHAT IS ART FOR A CHANGE? 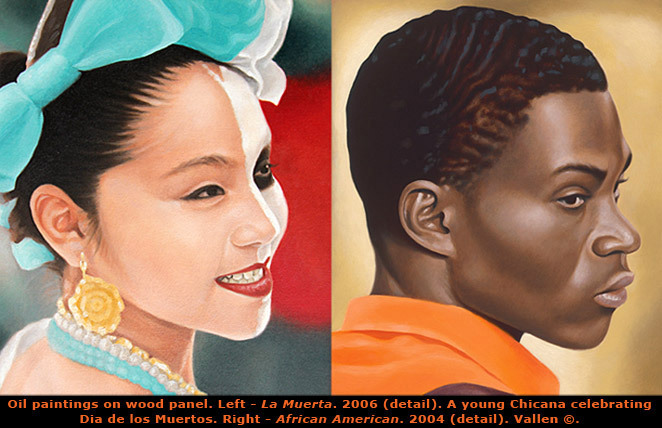 As a lifelong figurative realist artist based in Los Angeles and involved in socially conscious painting and printmaking, I believe that craft, skill, draftsmanship, beauty, and profound narrative content should be necessary features of contemporary art. 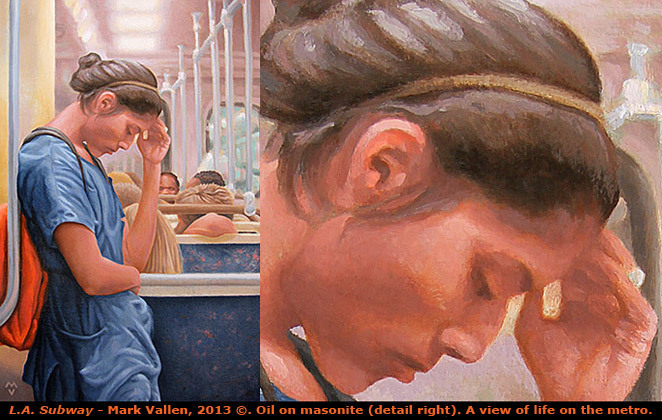 I view art as "the cognition of life," and insist that it is for everyone. I oppose the market mania that holds sway over the art world, and the democratic impulse that courses through me declares that art belongs to the people. Yes, dear readers, I am still enough of an optimist to think that art can influence the world in profound and beneficial ways. 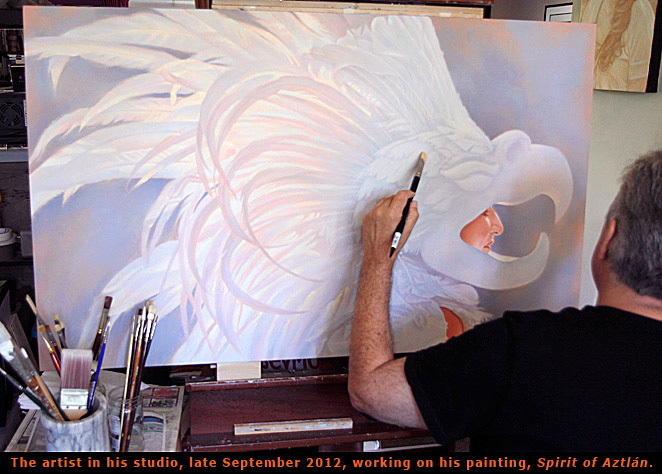 Throughout my career I have been associated with the school of Chicano Art because of its commitment to realism in art and its focus on social causes, but ultimately the artistic path I have forged has always been an independent one. You can read a full bio of my work here. In the late 1980s I began to use the nom de guerre, Art For A Change, for some of my artistic activities. By the mid-90s I created the Art For A Change website because I was thrilled at being able to instantly present my artworks to anyone with a computer (and now smartphones); I widened my audience from those visiting Los Angeles art galleries, to art lovers around the globe. 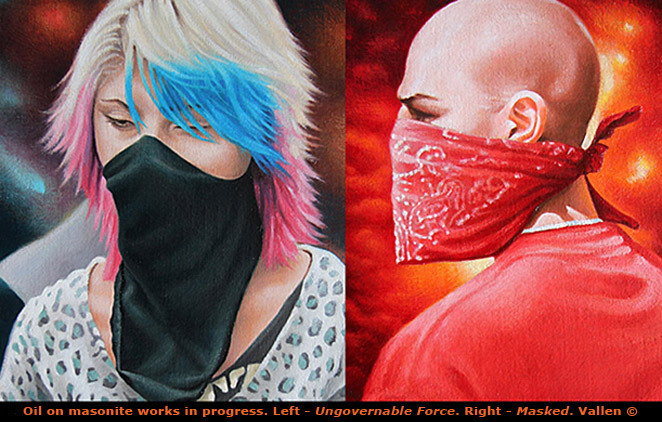 In late 2004, I started the Art For A Change blog to further promulgate my art and ideas. Now, following the 10th Anniversary of my blog, I am excited to take the project to another level with this Patreon campaign. There are few opportunities for socially engaged art in the public sphere. Even if the museum and gallery systems worked well for artists (and they do not), that still would not make an artist's work affordable and accessible to large numbers of people (galleries typically take a 40% commission). Here I want to appeal to those who appreciate art and culture. With Patreon you have the ability to extend direct material assistance to me as an artist; your patronage will not only provide compensation for my creating original works of art, it will lend a helping hand in the essential work of strengthening artistic literacy and understanding... no matter the size of your donation. 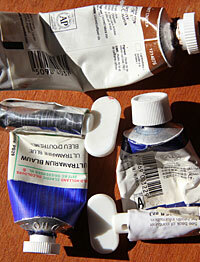 Art For A Change wants you to participate in the transformative power of art, it wants you to be more than a witness. Art For A Change is an idea, not an organization; the vision behind my Patreon project is not simply to support me and my artistic endeavors, but to involve you in reshaping contemporary art, and yes, to change the world. Inspired by the likes of Goya, Daumier, the German Expressionists, and the Mexican Muralists, my artwork has always focused on the human condition. Over the years I have distributed many artworks free of charge; public interventions designed to provoke thought, raise awareness, and inspire activism. Most of these works were poster print multiples given away in the thousands, as with the following highlights. In 1980 I created a silkscreen street poster titled Nuclear War?!... There Goes My Career!, a Situationist inspired work that poked fun at how a privileged few reacted to the threat of nuclear annihilation. The poster struck a chord and ended up as a cover illustration for the LA Weekly, becoming an iconic antiwar artwork from the 80s. In 1985 I created the hand-drawn silkscreen print titled Free South Africa, contributing greatly towards building the anti-Apartheid movement in the United States. In 1988 I published my drawing of war refugees from El Salvador as a bilingual street poster titled, Ningun ser Humano es Ilegal (No Human Being is Illegal). The image and slogan has become representative of the immigrant's rights movement. 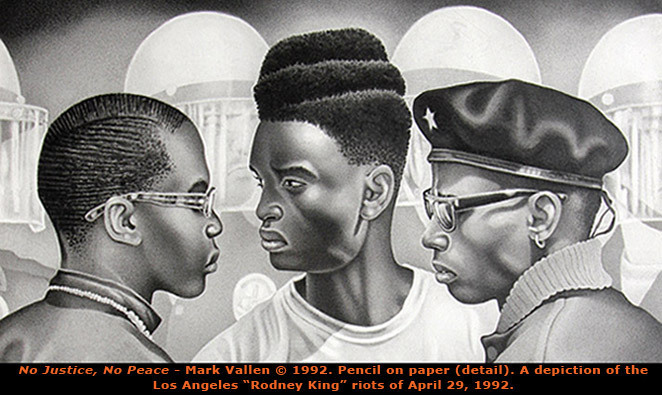 In the immediate aftermath of the Los Angeles Rodney King riots of 1992, I created a drawing based on those events, converting it into a flyer titled, No Justice, No Peace. In 2003 I published my drawing Not Our Children, Not Their Children as a flyer to be circulated on the streets as the U.S. bombing and invasion of Iraq began. 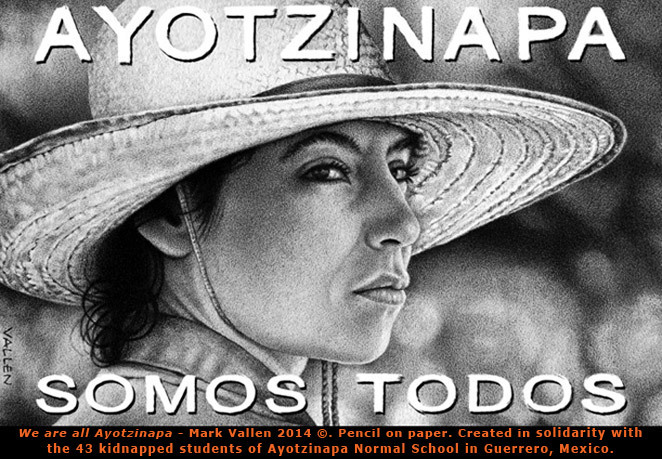 At present I am circulating over the internet my latest creation, the downloadable poster in solidarity with the Mexican people titled Ayotzinapa Somos Todos (We Are All Ayotzinapa). As the Mexican people make history on the streets of their country, you are encouraged to download and print free copies of my 11x17 inch poster for yourself, friends, and associates. Your kind backing and bighearted support via Patreon will help me to produce and distribute future works of public art activism. Some articles have taken me months to research, and involved travel to California locales outside of Los Angeles to document and photograph. Since its founding in 2004, the blog has spot-lighted artists who the mainstream art world has forgotten or ignored, uncovered hidden histories, offered far-reaching analysis of national and international cultural and political events, and spurred audiences to action on a variety of artistic and social causes. 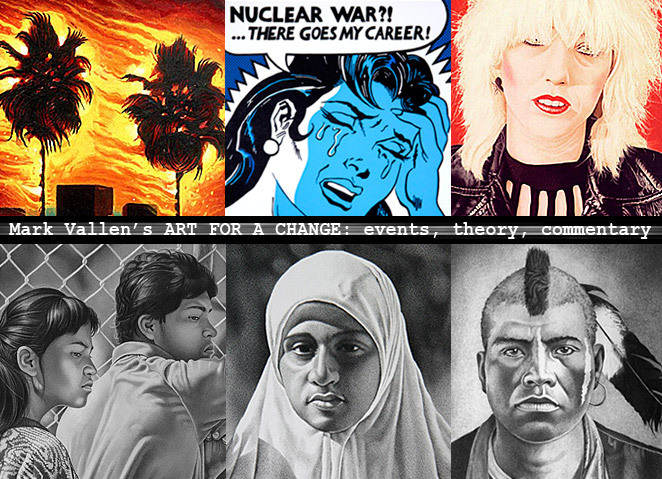 Over the years, my articles on the Art For A Change blog have won the attention of a mass audience, and hundreds of international art students, collectors, gallery owners, museum staff, and art aficionados have responded with queries and suggestions. Most months in 2014 saw at least 2 new articles posted on the blog, but oftentimes there were as many as 4. Now, with your generous Patreon support, the sky is the limit when it comes to my ability to cover art events and exhibits outside of my native Los Angeles. After registering with Patreon, anyone with a Facebook or e-mail account can fund my art with their credit card or Paypal account from anywhere in the world! Simply go to the top of this page and click on the orange Become a Patron button, then fill in your secure payment information and presto, you are now my patron! You can pledge any amount starting at $1 per month, and all funds will be used to further my Art For A Change project. For more information on becoming a patron, you can always read the Patreon FAQ. Think of Patreon as an ongoing artist grant, not one bankrolled by corporate power, an elite art institution, or a state bureaucracy, but one funded directly by the people of the world! What could be more democratic? No matter where you call home, you can become my benefactor and champion. Please note If you would prefer to not pledge a monthly donation through Patreon, you can always send me a one-time donation of any amount with a Paypal account, or buy one of my prints from my Art For A Change website. For long time supporters of my art and writings, you can rest assured that I will continue to compose new blog articles and create new artworks, making much of it available to the world for free. Having said that, with your kind Patreon sponsorship, it is certain that my artistic output will grow by leaps and bounds! With your support, reaching this milestone will give me the ability to purchase essential materials for my various painting, drawing, and print projects, as well as to provide for the rudimentary reproduction and distribution of my artworks. Also, this milestone will cover the basic operating costs of my Art for a Change blog and website, allowing for technical, software, and hardware upgrades.